I am very pleased to announce that libertarian interviewer of prominent U.S. politicians and pundits, Jan Helfeld, is scheduled to be on Exposing Faux Capitalism with Jason Erb, February 3, 2013, from 1 to 3 PM Eastern on Oracle Broadcasting. For more on Jan Helfeld, check out some of his most famous interviews. There are two major factors that keep Canada’s federal government on a tighter leash than that of the United States. One is the French-speaking majority province of Quebec, which represents almost a quarter of Canada’s population. While 50 U.S. states are divided and conquered to repeatedly hand over more of their exclusive constitutional authority, Canadians have a friend in Quebec, which is always sure to assert its interests, competency and exclusive jurisdiction in order to protect its unique cultural heritage within Canada. Another major factor is the better representation in the House of Commons than in the U.S. House of Representatives. At the start of 2012, there was an elected representative for approximately every 110,500 Canadians and 719,300 Americans. The United States has the second-lowest representation in its lower chamber in the world — less than Communist China, and second only to India. These are two political reasons that I propose would have rendered Canada more free than the United States had it been proportionately attacked as the U.S. was on September 11, 2001. With the 2008 financial crisis, some Representatives were getting 1000-to-1 calls against the bankster heist bill. If they had a representation factor like Canada’s, there would have undoubtedly been at least several Representatives who would’ve held firm to their original no vote and the bill may have failed to later pass the House in the form it did. The U.S. Constitution allows up to one Representative for every 30,000 Americans, so there’s no need for the current level of representation, unless you’re a bankster or one of their agents. 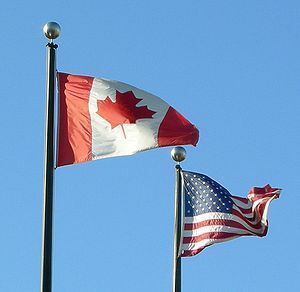 It is the result of these two major factors, among others, that the United States federal government is now more centralized and expansive than Canada’s.